When you learn how to dye bone beads and other components you open a new avenue for creating distinctive jewelry pieces. Bone is a natural material that is commonly available in bleached white and natural off-white cream colors, as well as various smoky tans and antiqued hues that result from the application of wood smoke and other antiquing colorants. However, the porous nature and stainable properties of this natural material are often underutilized by jewelry designers as a tool to personalize and enhance their jewelry design lines. Bone accepts dyes, stains and Gilders Paste® exceedingly well. The pale color of bone makes an ideal blank canvas to add any shade that may be present in mainstream fashion trends. Bone is also readily available in a myriad of smooth, textured and carved beads and components. Our vendors never harm animals for the sake of making beads or carvings. Cow, goat and water buffalo bones are a by-product of food, clothing and footwear production. The bones are cleaned, sanitized and carved into beautiful components or beads. The antiqued colors are not dyed but are obtained by placing bone in a smoker. The process for dyeing components and beads made of bone is basically the same as dyeing pearls or wood. Start with some dyestuffs, and then select the objects you wish to be dyed. Also, have a journal handy to record your dyeing recipe and process so that you can repeat or share your results. Bone is a protein-based material that displays a natural linear grain similar to wood. When you dye bone, the intensity of color will be determined by the length of time the material is exposed to the dye. Your dye can come from many different sources including food coloring, Kool-Aid, fruit and vegetable juices or water-based fabric dye such as RIT®. Experiment with many different kinds of dye sources to discover your favorites. Use the color wheel tool to better mix your colors. Bone can transfer its color, so it is necessary to seal in the color with an artist's fixative or other clear topcoat. This will also protect the color from fading. Bone may be dyed by dipping in a dye bath multiple times, soaking or applied using a sponge or brush. By mixing all the various dye application techniques, along with buffing it off of raised surfaces, you can mimic the look of aged leather, colored gemstones and antiqued patina. You can even create stylized ''tie-dye'' or two-tone blends with ombré shading. Again, since it is easy to forget small steps, application techniques and recipe quantities used during the dyeing process, you should keep track of it all in your dye journal by recording each step and detail. If you discover a recipe, blend or technique that's a keeper, it will be easier to recreate it without any guesswork or backtracking. Once you have the color you want, let the dyed bone air dry completely before you use a sealer. Be aware that some colors may darken as they dry, so if you make a heinous mistake you can easily remove the color with a dye remover and start fresh. The best thing to use to remove color from dyed bone is the same thing that removes heavy Kool-Aid stains from countertops ... common household bleach mixed with water in a 60/40 solution. Soak components just long enough to remove surface color and then rinse in water. Gentle agitation or scrubbing with a soft bristle brush, such as a toothbrush, may be necessary. Be careful how much you scrub any surface carving on the bone while it is in a softened state as you may inadvertently remove some of the fine details. There are other ways to add color to bone. Gilders Paste® is an oil-based medium, similar to shoe polish, that when applied to bone gives a nice accent of surface color. 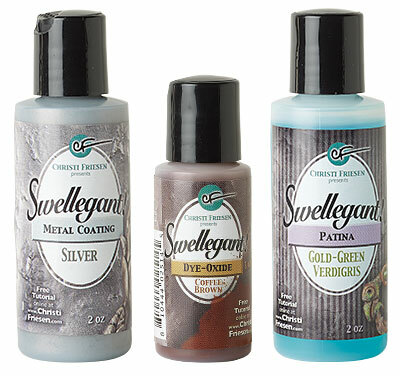 You many want to get adventurous and adding a metal surface to bone beads using Swellegant™ metal coatings, patinas and dye-oxides. There are several videos in which polymer clay guru Christ Friesen shows how to add a metal layer to components using Swellegant metal coatings and colorants. Using a hand dye technique on your bone lets you set your bone designs apart from the pack while developing a signature look for yourself. So go hunt down some dye and start coloring something beautiful! We would like to share some of the customer comments we received in response to the article, "Dyed Bone Components and Beads," featured in the a newsletter. Please keep in mind that the comments expressed below are those of our customers and do not reflect the views of Fire Mountain Gems and Beads. "Thank you so much for your wonderful newsletter. As a disabled person who does not get out much, your newsletter is one of the highlights of my day. Thank you and keep up the good work." "A very interesting article. I wondered if I could put watercolor paste in water and soak bone beads in it, let it dry and spray with acrylic sealant - does that idea have any hope of success? Thanks!!"